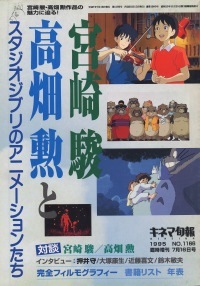 This page contains a listing of books written by or about Isao TAKAHATA. You can order these books through anime import stores listed in our Shopping Guide, though some of these titles may be out of print. If you have additional information on any of these titles, information on any titles we missed, or scans of any of the covers, please let us know. Prices may not include the Japanese consumption tax. Hardcover. Contents include movie planning notes, essays, interviews, lectures, conversations, etc., from "Omohide Poro Poro" to "Yamada-kun". Compilation of essays and interviews of Takahata. "A Tale of Tales" is an animation film by Russsian animator Yuri Norstein. Takahata loves this film. About a movie by Frederic Back. 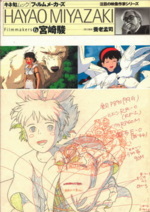 Contains interviews with Miyazaki, Sumi Shimamoto (voice actress of Nausicaa), Youichi Kotabe and Reiko Okuyama (worked on Heidi and other early works with Miyazaki, and some articles about Miyazaki and his films. Includes a black and white version of Imouto he (To My Sister). Articles about Miyazaki and takahata, a complete filmography (up to that point), interviews with Kazuo OHTSUKA, Yoshifumi KONDOU, and Toshio SUZUKI.